Over the years, our Christmas Eve traditions have changed as our family has grown and changed. Living in a rural area with lots of family nearby means that we usually have at least one if not THREE Christmas dinners to share with extended family on Christmas Day. So, having our main family celebration on Christmas Eve with my husband and kids has always been the norm. At our house, it’s a special time of anticipation and togetherness. But besides exchanging gifts, I’ve been searching for fun things to do on Christmas Eve that really reinforce the joy of Christmas – from a Biblical perspective. Christmas Eve Traditions: Jesus or Santa? 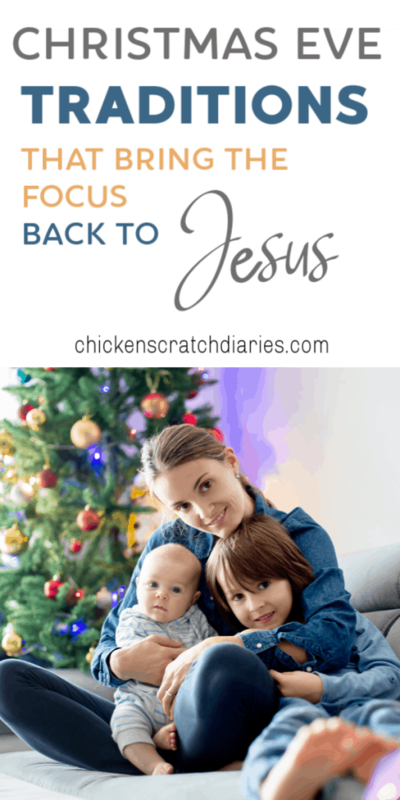 As my kids have grown (we now have a TEENAGER in our midst), I’ve struggled with how to appropriately emphasize the meaning of Christmas amidst all the chaos that comes with kids + presents! And really, shouldn’t every day focus on the “real meaning” of Christmas? The birth of Jesus, the ressurrection – His ultimate sacrifice? While I do try to weave these truths into our daily lives, it seems especially important at Christmas. To me, it’s become of even greater significance as the present culture seems to over-emphasize everything BUT Jesus. It’s all about the gift-giving, pictures with Santa, elves on shelves and of course, the food! 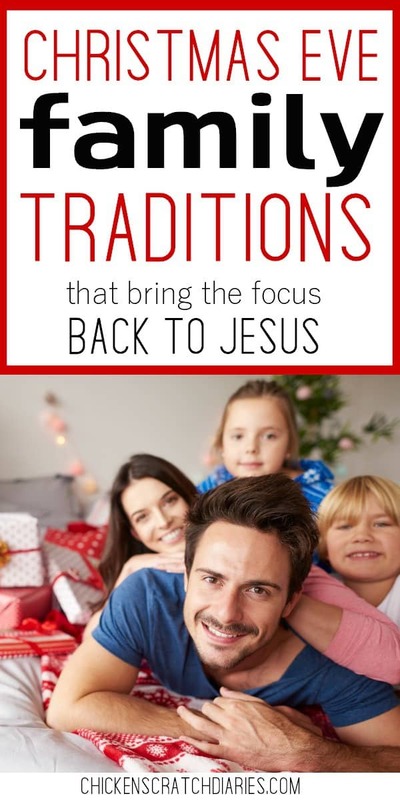 Not that there is anything inherently wrong with those Christmas traditions. Each Christian family I know has a different way of addressing the Santa / Jesus balancing act, and many do it beautifully. But I have weird ways of thinking and over-thinking about things. And apparently, what to do on Christmas Eve is one of them. I’ve decided that I just can’t go overboard with Santa anymore. I can’t make my kids sit on Santa’s lap just so I can have a commemorative picture. If I can be honest…it creeps me out more than a little! I can’t pretend to hear reindeer hooves on the roof…when there’s a true Christmas story just waiting to be told. I can’t lie to my kids if they ask me point-blank if Santa is real. So, I don’t. My husband and I just don’t worry about it. And guess what, our kids STILL have incredibly active imaginations. The younger ones like to pretend Santa is real but they’re wise enough to know otherwise. Now, Jesus. Jesus is who I want to invite in this year. And I want my kids to feel the joy of His presence – the joy that lasts beyond this season. So exactly how do we emphasize the One that Christmas is really all about? 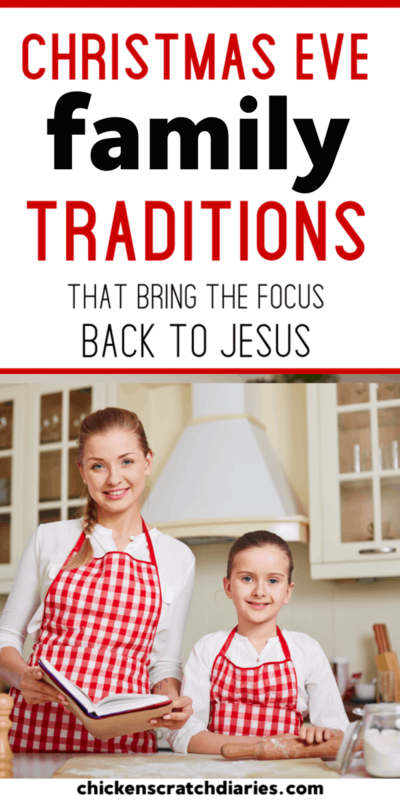 Here are 5 Christ-centered Christmas Eve traditions that I can totally get behind! We are incorporating at least a few of these Christmas Eve activities into our time of celebration this year. Kids love cake, right? So why not let them bake a special cake to celebrate the birth of the King? The last time I let my kids make a cake themselves, it went down in history as the “crunchy” cake. Let’s just say it was a little heavy on the sprinkles! The important thing is to celebrate Jesus and have fun doing it. My ten-year-old has wanted to practice her piping skills on cookies and cakes this year so I’m going to let her lead the decorating team on this project. So light the candles and sing Happy Birthday to Jesus! Our Church does not usually hold a Christmas Eve service but the last few years, we’ve enjoyed visiting other churches the night before Christmas. Typically, a Christmas Eve service in our area consists of a sermon that focuses on the nativity story and many times these are candlelit services. Of course, most people use LED candles now so you don’t have to worry about the kids + candles factor! I always think it’s amazing that no matter how many times I hear the Christmas story preached from Luke’s gospel, I can appreciate something new that God wants to impress upon my heart. Some Christmas Eve services will also include a live nativity which kids will love as well. If you’re fortunate to have a live nativity nearby with camels and donkeys…you don’t want to miss it! A Christmas Eve box can include any items you’d like, and you may have seen this idea circulating on social media over the last few years. The idea is to make up a special box filled with gifts that you can enjoy together as a family on Christmas Eve. You could include things like pajamas, popcorn, a family devotional, a Christmas movie, and anything else that your kids would enjoy. There are many Christmas movies you could choose from which focus on the gift of Jesus himself, including the ones pictured below. This is a fun and meaningful idea from Marie at Just Plain Living. Her family’s tradition is to stage the Nativity scene at the beginning of Advent and use the figures to act out the events leading up to Jesus’ birth. On the first Sunday of Advent, the Creche is displayed, then the family, then the shepherds so that everyone is ready and waiting the last week of Advent. The Child is put in the scene on Christmas Eve by the youngest child in the family. The Magi (wise men) start their journey to find the Christ Child on Christmas Eve. So starting on Christmas Eve, you could begin to hide the wise men around the house each night and have the children “hunt” for them up until Three Kings Night (January 6th), where you can make them arrive at their destination. I know that my kids will LOVE competing to see who can find the Wise Men first! This is such a fun way to teach the Nativity story and one they will look forward to each year. Read the story of Jesus’ birth from Luke chapter 2 as you re-enact the details in your home. There are many different ways you could do this if you want to get creative. You could even print a map of Mary and Joseph’s journey and discuss what it must have been like. We have the Fisher Price nativity set, great for little ones since it won’t break! But any nativity set would work, of course. For older children, you could also watch The Bible Project’s summary of Luke Chapter 1 and 2 found here on Christmas Eve. What better way to celebrate Jesus than to be His hands and feet! • Adopt a child through Compassion International and spend time as a family writing your first letter to him or her. • Find out other needs of community organizations and meet them. Many churches and other places serve meals on Christmas Eve and need food, donations and people to serve the meals. Christmas Eve Traditions: Carry them through the year! My hope is that, as we draw near to our Savior this Christmas it will impress upon our children the wonder and awe of the real Jesus who came to seek and to save what was lost. I want my children to grasp the miracle of His birth, the magnitude of our Lord’s sacrifice, and the Gift of salvation that we could never earn, afford or repay. Leading up to Christmas, my prayer is that we will all recognize the nearness of the Savior. That the joy we feel at Christmas will remain, and grow, and spread beyond us – beyond a season or a moment in time. After all, He didn’t stay in the manger – and thankfully, He doesn’t visit just once a year! 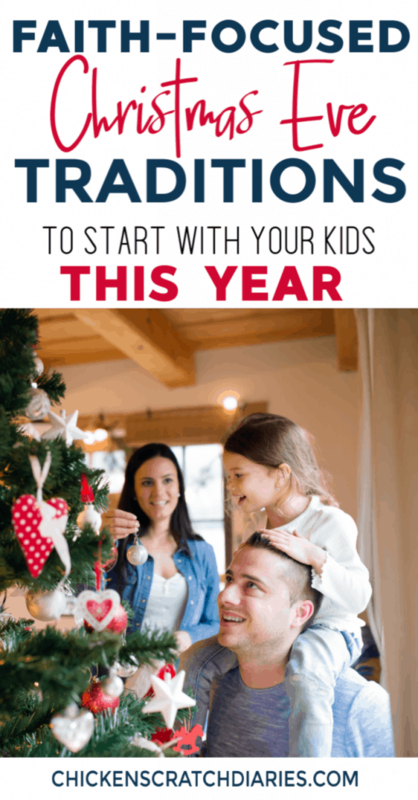 I hope these Christmas Eve ideas will inspire a Christ-centered celebration in your home that lingers and creates lasting memories for your family. • Are You Intentionally Spending Time with Family – or Just Marking Time? Thank you for this wonderful column. 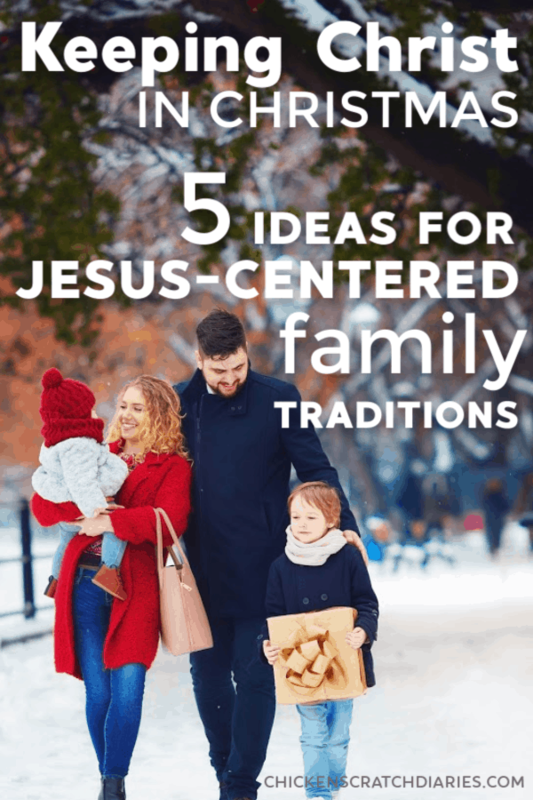 My husband and I want to be more Christ-centered every day, but especially at Christmas. You have inspired us to remember the reason for the season. God bless and keep you… and Merry Christmas. Thank you so much for the kind words, Sharon. It’s a wonderful season, isn’t it! 🙂 Merry Christmas.